Our 20-30 minute garden tours delight the eyes and the tongue! We offer samples of some of the most delicious and productive perennial vegetables and salad greens for northern climates, as well as tubers, berries and edible flowers. We started planting perennial beds in 2011 and plant more each year. 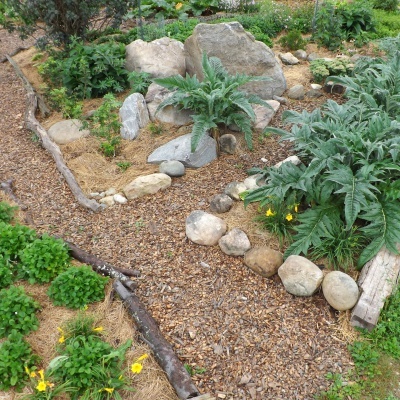 Our gardens are designed to mimic the structure and diversity of natural ecosystems, so as to become highly resilient, low-maintenance edible landscapes. We experiment wildly and grow lots of new plants every year. Tours are $3/person, by chance or by appointment.